There are few flavor combinations that I love more than lemon and blueberry. The sunny bright flavor from the lemon, and the subtle sweetness and gorgeous hue from the berries. I baked these lovely cupcakes for a Relay for Life radio auction here on the lower Shore, but I managed to keep a few to enjoy and take a few pictures of so I could share the recipe with you guys! As always, I used my favorite vanilla cupcake and vanilla buttercream recipe, then glammed it up a bit. Some lemon zest and lemon extract in the cake batter gives it that lemony punch that I was looking for. For the frosting, I cooked fresh blueberries down a bit with some sugar to soften up, then pureed and added to the buttercream. It creates a gorgeous color, that just screams “spring”! 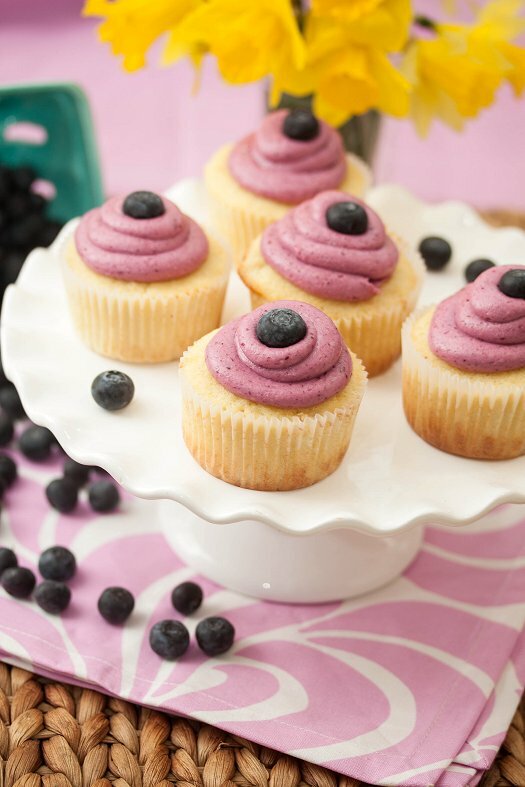 Garnish with a single, fresh blueberry – and you’ve got yourself one delicious cupcake. This makes a large batch too, usually for me it ends up being around 30 cupcakes. I never have a problem getting folks to take them off my hands though, I’m sure you won’t either! Take advantage of all the delicious berries popping up in stores right now, and make these cupcakes soon. In a medium bowl, combine the flour, baking powder and salt. Whisk to combine. In the bowl of a stand mixer fitted with a paddle attachment, add the butter and lemon zest. Beat on medium-high speed for about 3 minutes, until light and fluffy. Scrape down the sides of bowl and beat for 1 more minute. Add the sugar to the butter mixture, 1/4 cup at a time, beating 1 minute after each addition. Mix in the eggs one at a time until incorporated. Scrape down the sides of the bowl after each addition. Combine the buttermilk and the lemon and vanilla extract in a liquid measuring cup. With the mixer on low speed, add the dry ingredients alternately with the wet ingredients, beginning and ending with the dry ingredients and mixing just until incorporated. Scrape down the sides of the bowl and mix for 15 seconds longer. For the frosting, place the blueberries, sugar, and water in a small saucepan. Bring to a simmer over medium heat, and cook until blueberries soften and burst. Puree in a food processor or blender. Set aside to cool for a few minutes. In the bowl of an electric mixer fitted with a paddle attachment cream the butter over medium speed for 1 minute. Reduce speed to low, and carefully add in the confectioners sugar and a pinch of salt. Add the vanilla extract, as well as the blueberry puree. Increase speed to medium, and beat until smooth and frosting is combined. Frost cupcakes as desired and garnish with a fresh blueberry. I tried just the frosting , and it turned out awful. It was super runny! No matter how much I tried I could not get it to thicken! I was really upset. I’m not sure, Jacquie. Heat and humidity can certainly effect a frosting. When I have a frosting that doesn’t set up all the way, I’ll just add more confectioner’s sugar until it’s the thickness that I like. I’ve also found that in extreme heat and humidity, I’ll substitute a little bit of the butter (4 Tbsp or so) for some shortening or coconut oil. It helps it to be a little firmer. I just made this frosting for a lemon cookie. The frosting turned out fine, but it was missing more of a blueberry flavor and was way too sweet in my opinion, but that could be the combo with my cookie. Flavor depends a good deal on the quality of the blueberry…obviously, local blueberries picked in-season are going to have the best blueberry flavor. So many of the “blueberry flavored” things we have now are chock full of artificial flavor…the flavor of even a really good blueberry is still pretty subtle. I would like to bake this but as a CAKE rather than cupcakes- is that doable? Thanks. Absolutely. Bake for about 25 minutes in two 9-inch cake pans. I made this frosting to go in lemon macarons and I loved it!! beautiful color and great blueberry taste – I really simmered my blueberries for a while to intensify the flavor. Thank you! Isn’t it the prettiest color? I bet it’s delightful in a macaron! Thanks for coming back and leaving the sweet comment. I made this for my son’s first birthday, turned out great. Color is purple-ish, but very pretty. Yes, Rebekah – just a pinch. Missed it in the instructions. Or, just use salted butter and omit the salt from recipe!